Fabric Mart Fabricistas: Made by a Fabricista: Knit - Summer Hit and Miss! Happy Saturday Loves! I am officially on summer break and truly enjoyed the first week just relaxing at home and working out at the gym. I have not done any sewing this week but plan to start on my summer sewing plans next week. 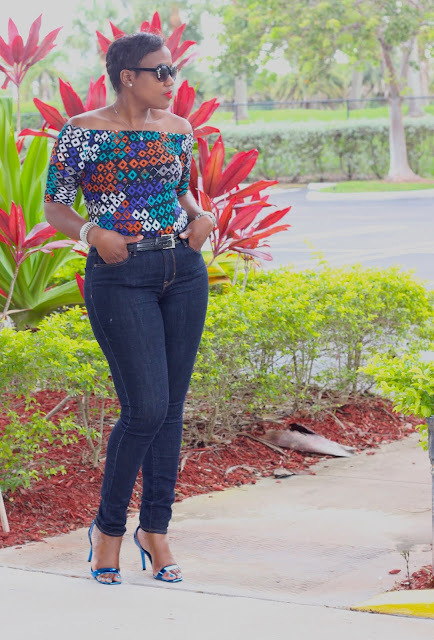 As an advanced beginner, I truly started my sewing journey 4 years ago working mostly with Ankara wax cotton, rayon, polyester and ponte knit and the only type of knit I was comfortable sewing with were scuba and ponte. In my stash, I have other knits including lycra and mid-weight jersey but really never had the desire to make basic pieces that I can buy for less than the cost of the fabric. 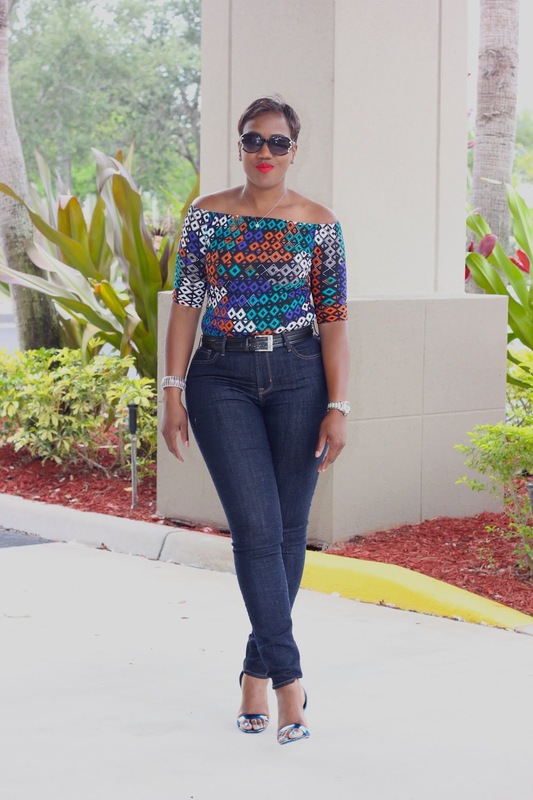 I came across 2 beautiful knit prints back in April and knew it was perfect for summer. I am in love with this top, made using Liverpool knit fabric. It is a beautiful midweight knit fabric for summer and is actually sold out but Fabric Mart has other selections including this beautiful flower print here. This McCall pattern (M7686) has been on my to sew list for a while so I created view D bodice and view F sleeves shortened for the warm summer weather. 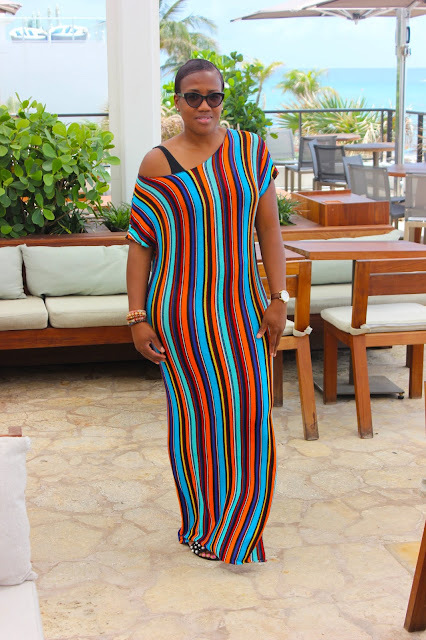 This summer, my main sewing goal is to create essential wardrobe pieces that will not be just for a few pictures to share on a blog, but pieces that I can wear daily. I have created a few summer tops which I love and have worn them several times already. The minute I saw the fabric, I knew I wanted to create a fitted off the shoulder to wear on a lunch date with a friend. Unfortunately, my jersey knit fabric (also SOLD OUT :-) was a miss as it did NOT work out as planned. I wanted to create Beaute Jadore's most recent gathered tunic top here and the weight of the fabric would not work as it was too light-weight and sheer for my personal taste to wear as a top or a skirt. I needed to use a solid crepe fabric and this jersey was NOT for the shape and style. Honestly, I really knew that I should have ordered a PONTE knit version for structure but wanted to try something different. 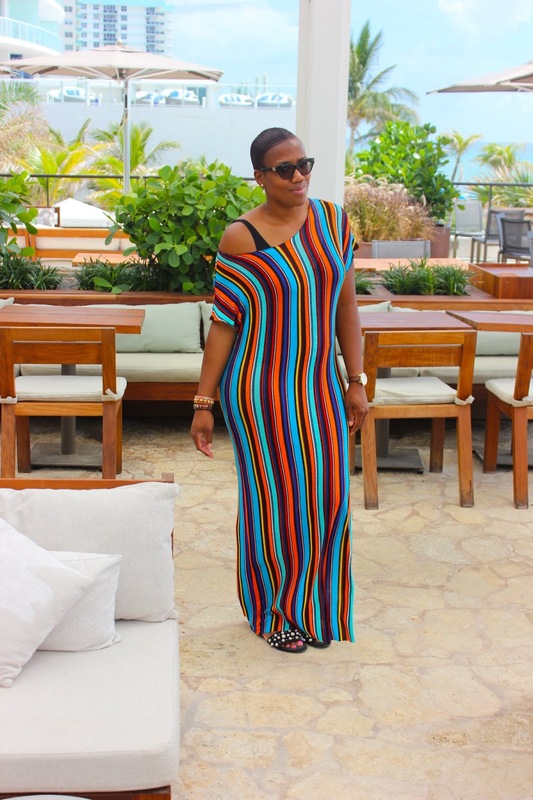 I surely recovered the fabric and created a beach cover-up dress for my day at the beach. Learning and understanding fabric weight, type and color based on a pattern design are essential before starting any sewing project. Large stripes and prints are tricky and bold colors may not always work for a curvy figure. I know for sure that I will always check the suggested fabric and NOT assume that a particular fabric will work for a look. I am not a fan of fabric that is too lightweight with minimal structure so the next project will definitely be from Julie's PICK or a fabric that I am familiar with. Thank you so much for stopping by and stay tuned for a few everyday work garments that I plan to make over the next few weeks. Have a wonderful summer and don't forget to stop by the blog to check out my latest makes! I have watching your blog for awhile. You have such wonderful style. I love this Liverpool top! Beautiful look! I love the fabric. I love the look! Beautiful top, looks great with the jeans. I love your lipstick color too. What color and brand is it? Thanks so much. I am wearing stunna lip paint from Fenty Beauty. 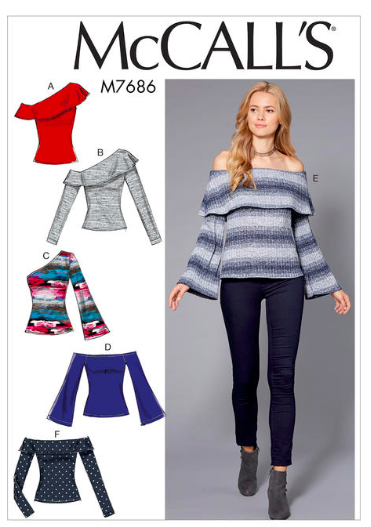 The off the shoulder top is so cute, and it looks so nice with your jeans--did you make those ones? Thanks Elizabeth, I did not make these jeans but plan to venture into jeans making again later this summer.